Sambucus canadensis, elderflowers along 316 heading west. The elder tree is in an honored class of plants reaching a legendary, supernatural status. European folklore surrounds elder with stories of its powers, rumors of it being the tree from which Judas hanged himself, and warnings to anyone who treats it disrespectfully, as it is a protector from evil and home to the fairies. Before harvesting any part of elder, the custom is to make an offering to the spirit of the plant. Reading of such superstitious hocus-pocus, skeptics will likely dismiss the plant, needing to experience its medicinal qualities to become true converts. Early summer displays elder’s (Sambucus nigra, European, and Sambucus canadensis, North American) white, lacey, flat-topped blooms along roadsides. As the summer peaks, the flowers give way to sprays of pellet-sized purplish-black berries. Elder loves moist areas; I’ve found it growing along the pond at Oconee Forest Park in Athens, and in wet ditches along roadsides. According to Dr. Michael Dirr, elder will tolerate dry soils, but has an “unkempt habit” and easily naturalizes, giving elder a weed status in his book. 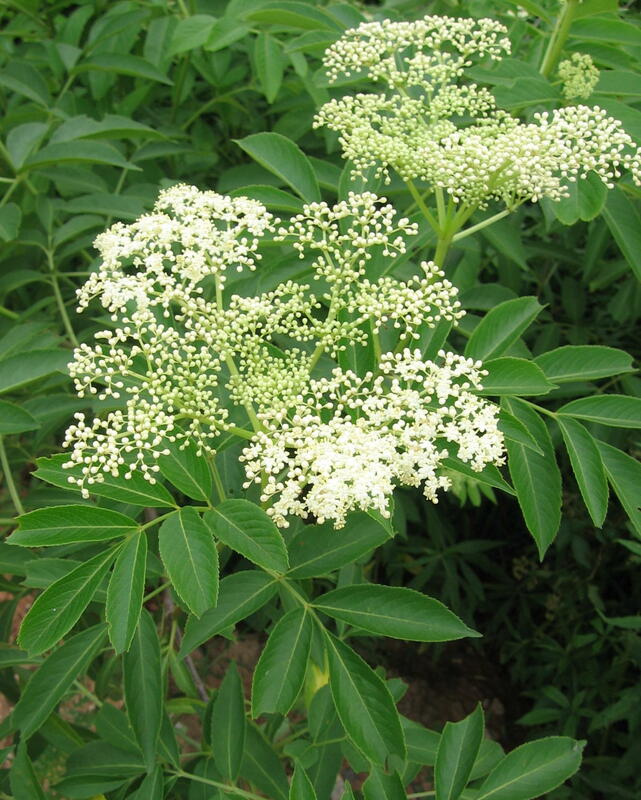 Traditionally, elder is considered a blood tonic among Europeans, American Indians and Appalachian people. Without knowledge of the mechanisms of the immune system, people theorized illness came from “bad blood”. Blood tonics, as a historical class of herbs, are excellent immune boosters and cancer fighters. Externally, elderflower water was popular among European women for removing freckles and sunburn. As Civil War medicine, according to Confederate surgeon Dr. Francis Porcher (1863), elder leaves were heated in lard as a salve for wounds and sprains. Dr. Porcher also reports the berries make better spirits than the finest malt. Elderberries (Sambucus canadensis) at Oconee Forest Park in Athens, GA.
Current research reveals elderberry and flower’s antiviral efficacy on influenza, colds, sinusitis, and Herpes simplex and zoster. 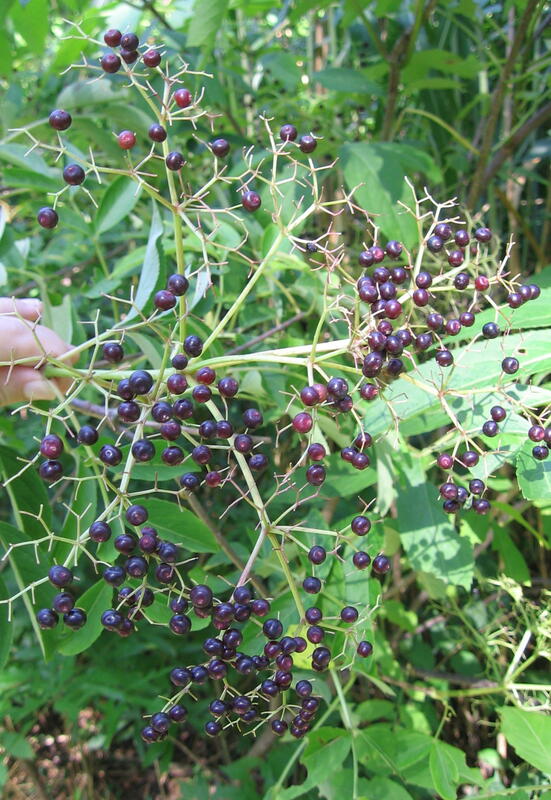 The flavonoids of elder contain immunostimulatory properties for influenza A and B. An in vitro study on H1N1 demonstrated how elderberry flavonoids would bind to and prevent H1N1 infection, by blocking the virus’ ability to infect host cells. Studies suggest elder’s immunostimulatory properties can be transferred to help with cancer and AIDS. In cases of methicillin-resistant Staphylococcus aureus (MRSA), where therapeutic options are limited, elder is an alternative to antibiotics by preventing some of the mechanisms for Staphylococcus aureus to survive. Elderflower’s flavonoids could be effective in the prevention and treatment of insulin resistance, stimulating insulin-dependent glucose uptake. The berries’ polyphenol antioxidants help lower the risk of metabolic diseases and cardiovascular illnesses. The flowers and berries are edible. Berries make delicious jams and syrups, which kids love, and elderberry wine for the adults. When they’re ripe, though, I just like to add them to my yogurt, getting an ounce of preventative medicine for the day. Steep the flowers as a tea, or fry them as a fish-tasting fritter. When harvesting elderflowers, lay the flower tops on plastic garbage bags for an hour or more to rid the flowers of resident insects. The bugs cannot tolerate fumes coming from the plastic. Berries don’t need the same treatment. And please remember to respect your elder, making an offering of thanks to the elder tree spirits. This article originally appeared in the Athens Banner-Herald, August 1, 2010. Purslane growing in Hull St. "vegetable garden". Loaded in omega-3s, purslane (Portulaca oleracea) is the eigth most widespread plant in the world. You may never have been formally introduced to this little plant, but by the time you finish reading, you’ll be glad to know this wild superfood, which is actually the eighth most widespread plant in the world. Purslane /Portulaca oleracea/ is a succulent annual that crawls along compacted soil. Its thick and fleshy leaves grow from a reddish stem, and its teeny, yellow flowers bloom only in daylight. Purslane is highly heat and drought-tolerant, perfect for cultivating in an Athens edible landscape. Between Trapeze Pub and Casa Mia on Hull Street, a unique vegetable garden grows. Where other vegetables are wilting from the heat and lack of watering, purslane is thriving. 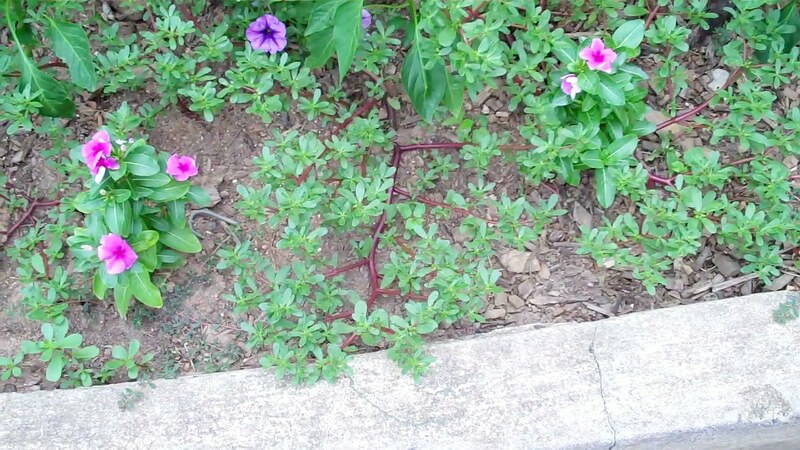 Notice the reddish stem of the succulent purslane. Ancient cultures worldwide have relied on purslane as a green leafy powerhouse vegetable par excellence. Though the weed may not be native, non-agricultural people of the Pacific Northwest foraged for purslane prior to European contact, proving that puslane has been in North America for quite some time. Among the Greeks, Cretans and Turks in the Mediterranean, purslane is a favorite wild vegetable to collect. 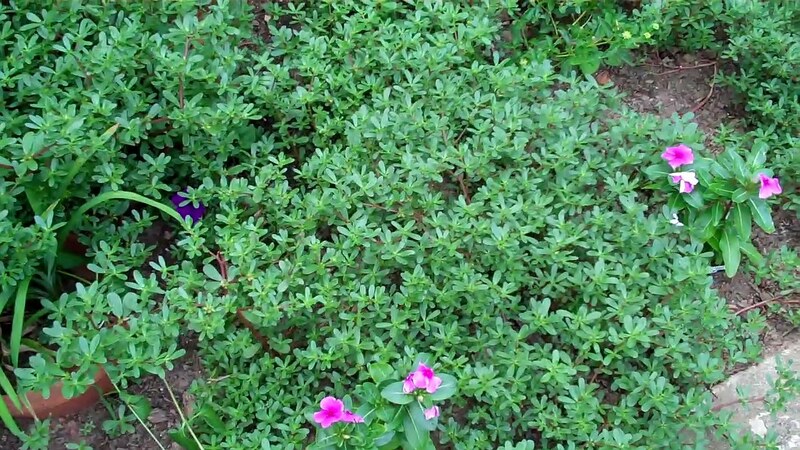 If stranded in a remote area, you would be fine if purslane were growing nearby. In fact, you’d probably be a lot healthier. Studies show that purslane’s nutritive value of vitamins, minerals, fiber and antioxidants is superior to cultivated foods. According to the USDA and Dr. Artemis Simopoulos, president of The Center for Genetics, Nutrition and Health in Washington, DC, “Purslane is the richest vegetable source of omega-3 fatty acids.” Within this little weed is the omega-3s in the form of alpha-linolenic acid (ALA) and antioxidants, such as phenolic compounds, alpha-tocopherol (a vitamin E), ascorbic acid (vitamin C), beta-carotene (precursor to vitamin A) and glutathione (a compound which metabolizes toxins in the small intestines and prevents their transport to other tissues in the body). Purslane’s yield of omega-3 ALAs far surpasses any other non-aquatic source, that it just might convert you to foraging. ALAs are a proven cardio-protective nutrient, and its antioxidant-rich content means that purslane is a powerful superfood that can protect against cancer. In Trinidad and Tobago, purslane is a common herb used for diabetes mellitus. A study in mice with diabetes mellitus found a decrease in blood glucose, increase in good HDL cholesterol and a decrease in triglycerides when the mice consumed purslane. The U.S. has overlooked this weed to the detriment of our health. Eaten raw, this culinary weed adds a delightful, juicy, sour crispness to salad, or it’s also delicious cooked like spinach. One study found that the ALA content was higher in purslane exposed to low temperatures, so you might want to put purslane you’ve just collected in the fridge for an hour before eating. But wait, there’s more. Remember all the concern a few years ago about bisphenol A (BPA) in plastics? Purslane, the wonder-plant, can remove BPA from water in 24 hours, according to a Japanese study. Soon, purslane will be put to work in phytoremediation of contaminated industrial wastewater. Purslane keeps delivering the goods.